To combine both the Ionian Sea as well as (parts of) the Aegean Sea you will need a 3 weeks+ sailing holiday, not merely because of the distances involved but for all the must-see ports, ancient archaeological sites and picturesque anchorages. 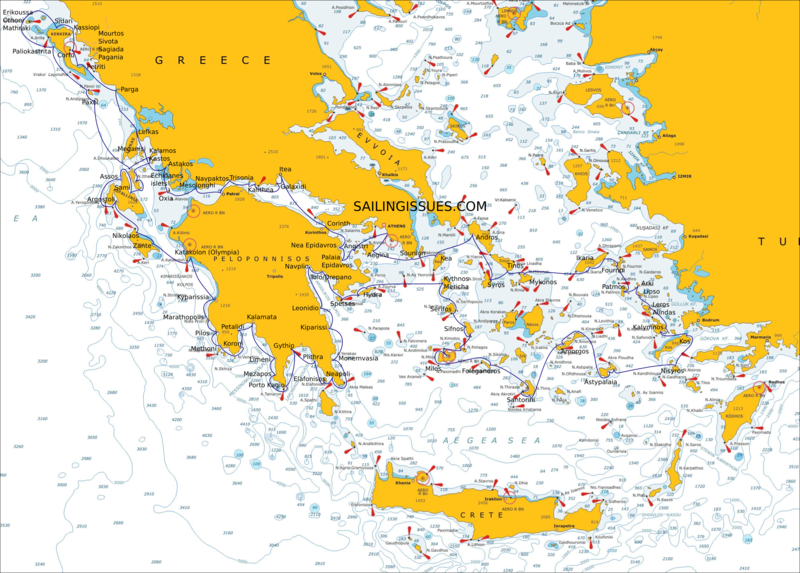 For yacht charters (find reliable yacht charter companies) it makes most sense to start out of Athens since most of the yachts are chartered out of the Alimos/Kalamaki marina (most options, best prices), although you could obviously start at any charter base along the route: Kos, Paros, Lefkas, Corfu etc. See also: the Aegean itineraries 3 weeks+ without the Ionian. This well balanced route includes the spectacular off-the-beaten-track region of the southern Peloponese and combines the best of the Cyclades and Dodecanese / Eastern Sporades with the easier sailing areas of the Ionian and the Argo-Saronic Gulfs. 80 venues, but lots of these stop-overs deserve a visit of two days or more !